RStudio Connect is a publishing platform for the work your teams create in R and Python. Share Shiny applications, R Markdown reports, Plumber APIs, dashboards, plots, Jupyter Notebooks, and more in one convenient place. Use push-button publishing from the RStudio IDE, scheduled execution of reports, and flexible security policies to bring the power of data science to your entire enterprise. Have questions? Schedule a meeting with sales. Click ‘Publish’ to send your work to RStudio Connect from RStudio Desktop, RStudio Server, or RStudio Server Pro. RStudio Connect supports just about any static or dynamic content your team can create in R.
Give your R users control of the work they share. With RStudio Connect they can see what they’ve published, decide who should be able to view and collaborate on it, tune performance, schedule updates, view logs of their R processes and more. Schedule your R Markdown reports to run automatically or even distribute the latest version by email to your teams. 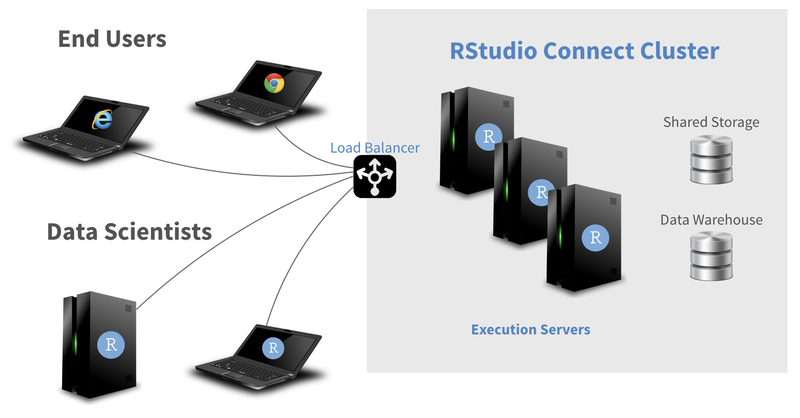 RStudio Connect is on-premises software you run behind your firewall. Keep control of your data and who has access. Work with your organization’s preferred identity security, including LDAP/Active Directory, Google OAuth, PAM, proxied authentication, or an internal username/password database. Create rich tag hierarchies to organize content. Search tags to discover content. Easily tag new content. Host R functions as RESTful APIs to integrate R with other systems. RStudio makes it easy to access and analyze your data with R. Use RStudio Professional Drivers on your system when you run Shiny apps or R Markdown docs that access your production databases. Enable RStudio Connect to run across a multi-node cluster, providing an option to scale compute horizontally and ensure high availability for all the R content you depend on.